Wishing everyone out there in Cakeland a very Merry Christmas and a Happy New Year! Thanks for the follows and the comments. Here’s to a new year full of cake adventures. In 1998, in my neck of the woods in Eastern Ontario (Canada), we experienced 3 days of relentless freezing rain which in turn took down thousands of power lines and poles rendering us all powerless. The small towns in our area took about a week to get reconnected. Out in the country it took a lot longer to get hooked up again. We were out of power for 21 (long) days. Memories of that time: wood stoves and gathering wood; darkness; candle wax everywhere; the Canadian army coming over every two days to hook up a generator (we didn’t have one) so that we could pump enough well water to last us till their return; people dropping in to see if we were okay; the kindness of strangers; a neighbour who loaned us his pickup truck because our car stopped working (great timing! ); no telephone and feeling totally cut off from the rest of the world; listening to the radio and hoping our batteries wouldn’t run out (there was a shortage of batteries locally! ); the silence and pitch blackness of the countryside. Twenty years later, our local museum, The Glengarry Pioneer Museum, decided to have a fundraiser to reflect back to the Ice Storm of ’98. I was asked to do a cake for auction. I decided to try to emulate that feeling of ice and snow and darkness in the little gingerbread house atop the cake. The white chocolate drip reflects the icicles that were dripping on everything. The candied rosemary is meant to be reminiscent of the heavy ice that had the pines and cedars bent over with the weight of that ice. I love the vintage feel of this cake. The retro bottle brush trees and the metal Matchbox station wagon, with the just-cut tree tied to its roof. The cake has a Norman Rockwell feel to it, like everything is peaceful and sweet and lovely. Here’s hoping that your Christmas is peaceful and sweet and lovely. I made this 6″ cake, four layers, each filled with lemon buttercream and lemon curd as a dessert for a winter lunch. I love the look of the bottle brush trees, giving the cake a sweet vintage feel. An easy-to-decorate cake, this was a pleasure for the last cake of 2016. 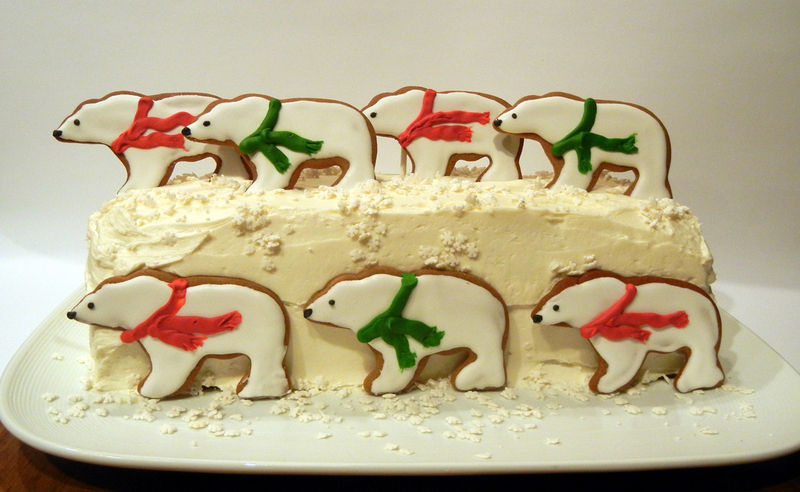 I made polar bear gingerbread cookies to give out as Christmas gifts at work this year, so when my boyfriend’s sister asked me to bring dessert for Christmas dinner, the “March of the polar bears” cake was a natural.